Although the Dream Defenders takeover of the Florida State Capitol uses the same tactic of occupation as the Occupy Wall Street movement, in many other ways the movements are polar opposites. As shown in the Steven K. Bannon film Occupy Unmasked, I extensively covered the OWS movement, including traveling to occupations in New York, Newark, Oakland, San Francisco, Berkeley, Tampa and Dallas. I’ve also been on the ground covering the Dream Defenders takeover for Breitbart News since the minute it began a week ago. I’ve seen with my own eyes that there are some big differences. A number of Dream Defenders I’ve spoken with have shown open disdain for Occupy Wall Street, often accompanied by eye rolls and grimaces. They have consciously eschewed Occupy Wall Street tactics and learned from that radical group’s mistakes. As a result, the Dream Defenders have built a sustained and sustainable protest that will continue to garner press and wear down the opposition the longer it goes on. Conservatives aren’t doing themselves any favors by having any illusions about the professionalism or effectiveness of these tactics. Here are a few key differences to understand. 1) While Occupy Wall Street was noticeably filled with privileged white college kids, the Dream Defenders is overwhelmingly black college students. One result of this is that the Dream Defenders protest has lacked some of the flavor of teenage rebellion and anarchism often evidenced at Occupy. The historical analogy here is to the Weather Underground, in which privileged white kids like Billy Ayers, Bernadine Dorhn and Kathy Boudin cheered on the destruction even as their friends were blowing themselves up with bombs. One Dream Defender told me that the white kids who have become involved with the group tended to be more radical and needed to be talked down. “You aren’t the ones who will get arrested first,” they are often told. 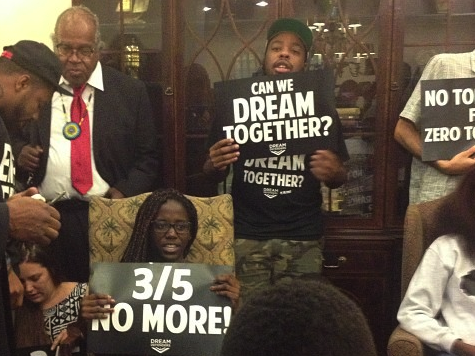 2) The biggest and most obvious influence on the Dream Defenders is the early civil rights movement. There is frequent singing, and often open, unapologetic Christianity. When the group was locked into the Capitol building over the weekend, they participated in a church service on Sunday morning. In contrast, the major influence on the Occupy Wall Street movement was clearly the confrontational tactics seen at the 1968 Democratic National Convention and the resulting angry street theater in Chicago. The primary spirituality I saw in Zuccotti Park was an artistic collection of rocks and sticks that seemed connected to Wicca. 3) Occupy quickly became a sprawling movement, with occupations going up around the country and even around the world. The Occupy movement made a big deal of how many affiliates they had, but the problem was that most of those encampments were pitifully small. The Dream Defenders protest, on the other hand, is completely focused. It exists in just one place, and because of that the group is able to manage both the logistics on the ground and the messaging. 4) Whereas the Occupy movement famously never made it clear what exactly they wanted, the Dream Defenders have a clear set of demands. With their takeover of the Florida State Capitol, for example, they want to see a special legislative session called to address Stand Your Ground laws, to stop police profiling, and to put an end to what they refer to as the “school-to-prison pipeline.” That contrast in clarity has lead to better media relations, and makes the Dream Defenders much more likely to achieve some sort of practical goal. Remember, Dream Defenders was effective last year in pushing Sanford to remove police chief Bill Lee–with the help of the Department of Justice–and were also instrumental in causing the arrest of George Zimmerman. The Justice For Trayvon movement is at crossroads, teetering on the edge of dissipation. Al Sharpton’s rallies this past weekend visibly failed to draw white liberals out of the local Starbucks and into the streets. The Capitol building takeover is currently the sole focal point in the Justice for Trayvon movement, and it is the kind of event that the Democrat elite can cheer from the sidelines; MSNBC Chris Hayes led with a 14-minute segment on the movement, and an interview with Dream Defender Phillip Agnew on last night’s episode of All In. More importantly for politicos to grasp is the fact that the Dream Defenders protest is a magnet for young people. The long-term goal is straightforward and explicit: the 2014 vote. Once in the Capitol, the Dream Defenders are giving the enthusiastic participants orgaziner training, right in the governor’s office. Think of that for moment: liberal organizers are literally learning their craft in Gov. Rick Scott’s waiting room. The Dream Defenders are not Occupy Wall Street. Underestimating what’s happening in Tallahassee is a mistake that could come back to bite Republicans in the midterms–and beyond.